Getting accepted into law school is a difficult task in and of itself. But it is only half the battle. For the next three years, you can expect to spend 60 hours a week or more studying. The knowledge that you acquire is extremely important because the fate of your future clients depends on your law skills. 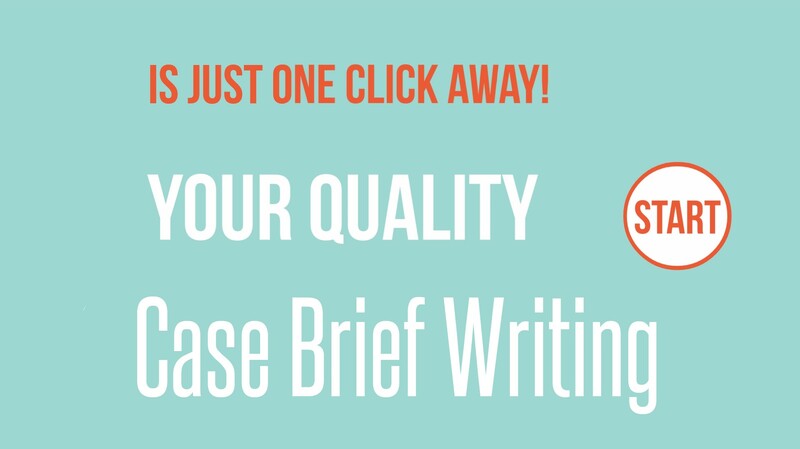 Case brief writing is one of the more common assignments that you will be expected to complete. Let us take a quick look at this type of legal writing. A case brief is a comprehensive summary of the facts of a legal case. Case brief writing typically follows a systematic structure and involves highlighting the key facts of a case, outlining the relevant legal issues, and discussing the arguments made by the opposing legal parties. It also concludes by discussing the judges’ decision and how they reached their opinion. Good case brief writing starts with determining which legal issues the case under review falls under. Choose a case that is relevant and has an impact that can be felt today. It is not necessary to include every single detail, so to save time avoid any irrelevant information. If you choose a lengthy case, start by looking through the case summary and review any other cases that are relevant. Take notes and find an organized way to categorize your information so that you will not have to keep flipping through pages in order to find it again. Now that you have created a summary, it is time to begin writing the full case brief paper. The title informs the reader about the case, including the names of the respective parties. The citation helps the reader find the actual case itself if they wish to read it in full. Summarize the facts of the case brief. This is perhaps the most challenging part of the paper since you will need to decide which facts are pertinent and which ones can be omitted. Unless necessary, it is not important to mention every key witness or such details as car makes and models. Need to buy case brief? We want to make it all easier for you! What was the nature of litigation? What legal remedies are the litigants seeking? What were the relevant laws? What is their motivation for bringing the lawsuit? Write one-sentence length questions that identify the issues of the case. List the legal arguments raised by each of the respective the parties to support their positions. Discuss the decisions made by the court, including their rationale. This can involve listing relevant cases that served as legal precedent. If the judges do not render a unanimous opinion, it is important to include the dissenting opinion, along with what the judge believes to be the flaws of the majority’s opinion. In some cases, a judge might agree with the majority, but express different legal reasons for it. In this case you would discuss their concurring opinions. This is where the judges would explain which principles they applied when rendering their opinion. Discuss why the case is so important and how it compares to similar cases that have come about since then. Also, mention how the legal system has evolved over the course of time, using this case as an example. Was the court’s decision correct? Is it consistent with past judgments? What circumstances lead to changes in attitudes based on how the case was decided? If you take these tips to heart and apply them to your case brief writings, you should be fine. However, if you need assistance, you can count on the legal brief writing services of QualityCustomEssays.com to deliver. We want to see you succeed as a law student and a future lawyer, and we know that the first step to achieving your objectives is to get high grades. This is exactly what our brief writing services were created for! When you are a law student, you have a whole lot on your plate. Not only do you have to take a load of courses and do all of that required reading, you also have to turn in a ton of legal assignments. If your workload is becoming too much to bear, why not entrust the legal writing service experts? Our professionals have the experience to do the job right. Plus it frees up your time to focus on the assignments that really matter most to you. Our company has a team of legal experts who dedicate themselves to their craft. They know the ins and outs of case brief writing, and can help you get the grades that you need to graduate from law school. We know that your professors are going to double check and make sure your information is accurate. This is where our professionals really shine. They do more than just throw a few legal words together. They do the research, analyze cases that are similar to the case briefing under examination, and will always complete your work on your specified deadline. Every work that we do is run through our state-of-the-art plagiarism software which ensures that your case briefing is totally original. We also have a team of proofreaders and editors who will look over the paper and make sure it looks its best. With so much riding on the outcome of your case briefings, do not leave anything to chance! Order your custom case brief writing from our legal experts and let our team handle the burden. What Makes Our Brief Writing Services So Successful? We offer high quality products at very reasonable prices.